Dr. Samuel Evans James Building, Frankfort, Ky. This week, when fact checking a chapter from the epic new history being written about the James family where Dr. Samuel Evans James and John E. Miles both appear, Russell Hatter offered us this photo from the archives of his Frankfort Heritage Press. 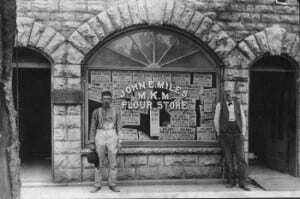 The image of the building owned by Dr. James in Frankfort, Kentucky in which Miles operated a flour store formerly was donated by Steve Moore and has never been made public before. 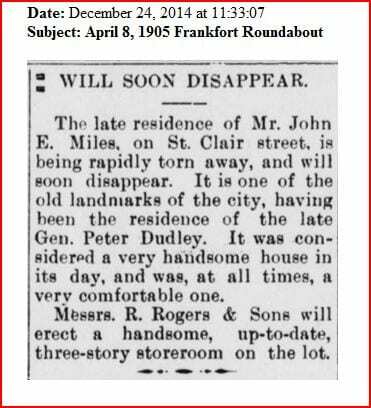 This building stood on St. Clair St., in Frankfort opposite the Franklin County Courthouse. 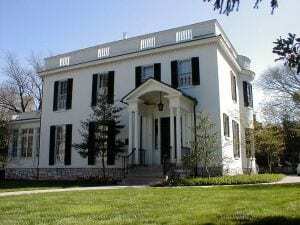 As Dr. James conducted his medical practice, across the street his father, the eminent jurist Judge Andrew Jackson “A. J.” James practiced law as lawyer, Commonwealth Attorney General, and judge. This building was torn down about 1900. John E. Miles was distantly related to the James through his wife, Annie Hawkins. The James, Hawkins, & Miles descendants share many common ancestors in colonial Virginia, among the Dabney, Strother, Keith, Willis, Thornton, & Randolph families. 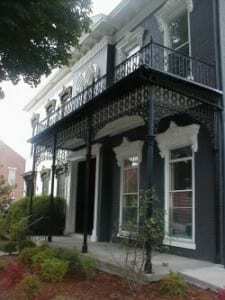 Dr. James and his wife, Sallie Jouett Taylor, made their home at 418-420 Anne St. in Frankfort, seen here today with its separate business entrance on the far corner of the home. Sallie was born at 210 St. Clair St., a short distance from the upstairs office of Dr. James. The Taylor’s family’s residence was next to her father’s Farmer’s Bank, where A.J. James also had served as bank president. The residence of A.J. James stands at the corner of Main & Wilkinson Streets, and is now occupied as lawyers offices. For more about A. J. James, and Dr. Samuel E. James, click HERE. The Frankfort Heritage Press maintains an excellent website, that also sells their fine books about Frankfort’s early history. A. J. JamesAnnie HawkinsFrankfortFrankfort Heritage PressJohn E. MilesRussell HatterSallie Jouett TaylorSamuel E. JamesSamuel Evans JamesSt. Clair St.